US Secretary of State Rex Tillerson seemed to lay out a new strategy on North Korea on Tuesday, but the White House followed with a vague statement that seemed to dispute him. China and Russia welcomed Tillerson’s new stance, which would allow the US to talk to North Korea without preconditions. But President Donald Trump seems set on putting pressure on North Korea. Secretary of State Rex Tillerson laid out a new US strategy toward North Korea on Tuesday that was met with cheers in Russia and China but may have been squashed by the White House on the same day. “We’re ready to talk any time North Korea would like to talk, and we’re ready to have the first meeting without precondition,” Tillerson said at an event at the Atlantic Council. His words appeared to signal a significant shift in US policy toward North Korea. President Donald Trump has sought to pressure Pyongyang to surrender its nuclear capabilities. Tillerson’s approach would allow the US and North Korea to begin peace talks without the prospect of denuclearizing. 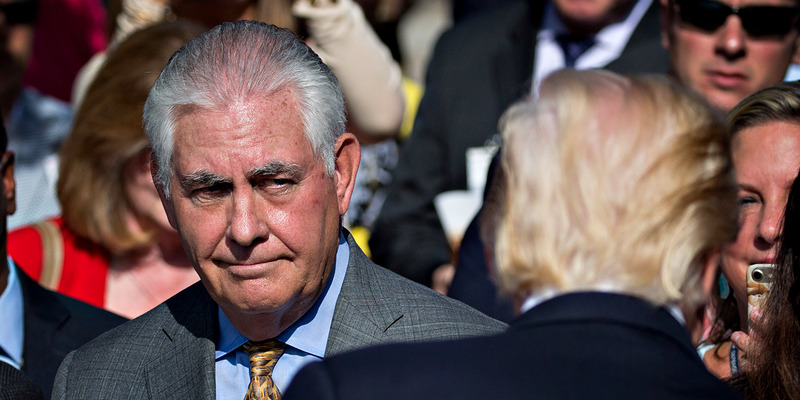 Instead of the promise of verifiable denuclearization, Tillerson simply asked for a “period of quiet” in which North Korea pause testing nuclear devices and ballistic missiles. Russia’s deputy foreign minister, Sergei Ryabkov, told Russian media he welcomed the decision. China’s Foreign Ministry spokesman, Lu Kang, told a press briefing the same. But the White House, where Tillerson has reportedly fallen out of favour, seemed to push back. Hardliners on North Korea say that if the US were to accept talks with Pyongyang without preconditions, it would give the country a seat at the table with Washington as equals, something they consider a defeat. Trump has frequently talked up military and kinetic responses to North Korea’s missile testing, and he has often undermined Tillerson’s efforts at diplomacy, once calling them a waste of time. In the past month, Trump administration sources began leaking that Tillerson may be on his way out of the executive branch in favour of a Trump favourite, CIA Director Mike Pompeo. Past presidents who have looked to engage with North Korea diplomatically without first securing guarantees from Pyongyang have faced strong backlash from more hawkish US officials, usually Republicans. Trump may have the unique opportunity to engage with North Korea, as he has proved at least partially insulated from the criticism of Republicans. Additionally, Trump has said he would be “honored” to meet with Kim Jong Un, the North Korean leader whom no head of state has ever met with. The US has engaged in a massive pressure campaign of sanctions on North Korea that may have begun to take effect. If the US could hold out and wait until sanctions further weakened North Korea, it may achieve a better negotiating position in future talks. But with North Korea having demonstrated an intercontinental ballistic missile and threatened to detonate a nuclear device over the Pacific, the US has a choice: Settle now before things escalate, or continue the nuclear showdown until one party blinks.